OMG Posters! » Archive Two New Concert Posters by Ken Taylor (Onsale Info) - OMG Posters! Tomorrow will see the release of two great new concert posters by Ken Taylor. 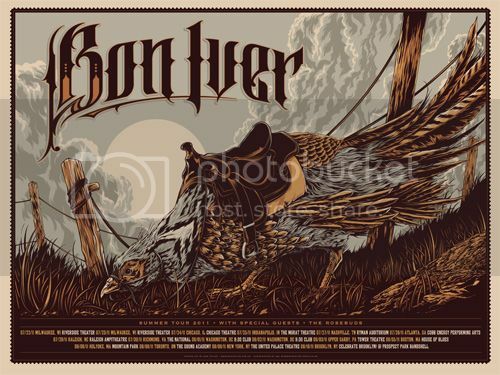 The Bon Iver is an 18″ x 24″ screenprint, has an artist edition of 100, and will cost $35. The Decemberists is a 12″ x 36″ screenprint, has an artist edition of 70, and will cost $30. Both go up tomorrow (Wednesday, August 31st) at 12pm Central Time. Visit Postersandtoys.com. Taylor is a machine, churning out great posters like it were nothing. Definately copping one of the Bon Ivers. that bon iver print REALLY reminds me of his MSG phish print…which i LOVE! Is Ken even capable of making a bad or mediocre print? Great prints. I thought his Kate/Claire print for Lost was pretty mediocre at best but that’s all I can think of off the top of my head. I kind of think Ken Taylor should have his own holiday aka Ken Taylor Day. i’d love to get the cuckoo clock. too bad the decemberists are on it. ..
that is my 4th taylor print i now own….THANKS KEN!! keep it up man! I just did my part to help sell out the Bon Iver print. The only thing better than a rooster is a giant riding rooster. Been trying to get a hold of the Bon Iver print for ageeeeeees. Its top of my art print list. I have a few by KT already, he’s class. Let me know if anyone knows of a sale anywhere that isnt a crazy price.